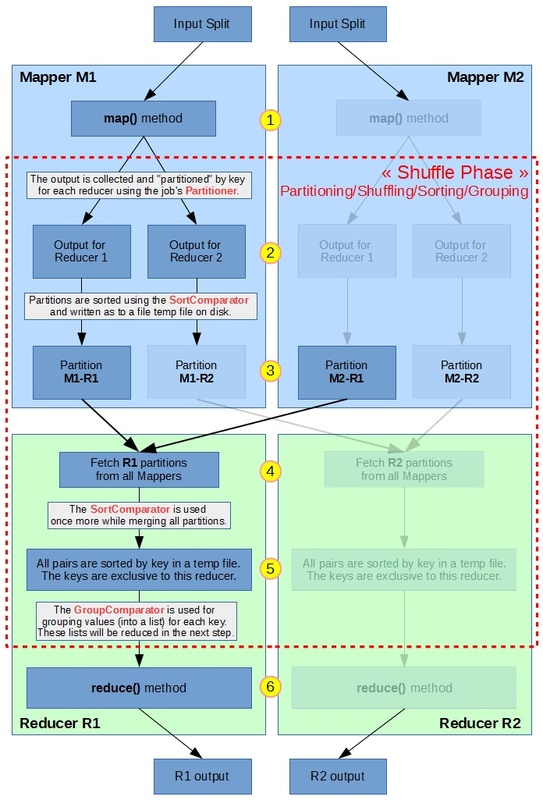 In the MapReduce solution illustration in the previous post I represented the shuffle phase as a mysterious dashed box between the map and reduce methods. I also said that it sorts pairs automatically by key before giving them to the reducer, and we took advantage of that to sort our results. The map method from a mapper receives all (key,value) pairs from its split, provided by the InputFormat. This is the most important method that we usually code in a Mapper. In the previous part we filtered out and projected the input data in our implementation of this method. The outputs from the map method are partitioned for each user using the specified Partitioner. By default, the HashPartitioner is used in MapReduce. It uses the key’s hashCode() value and perform a modulo on the number of reducers. This will randomize how the (key,value) pairs are stored in different partitions for each reducer based on the key. All pairs with the same key will be in the same partition and will end up in the same reducer. The data is sorted using the specified Sort Comparator the before being written to disk. The partitions are all written in a same temporary file. The reducers fetch all of their assigned partitions from all mappers. The partitions can either be written to a local temporary file, or stored in memory if they are small enough. 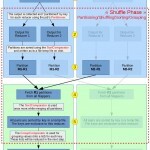 This process is also known as “shuffling” because partitions are being shuffled around. The Sort Comparator is used again while merging all in-memory and on-disk partitions. Each reducer now has a fully sorted list of all (key,value) for all keys assigned to them by the partitioner. The Group Comparator is used to group values into a list. The reduce method will be called with parameters (key, list<values>) for each “different” key, according to the comparator’s definition of “same/different”. In the previous part we only used 1 reducer, so there was no partitioning. We did not define a group comparator, so grouping was done naturally on Text equality (first job) and FloatWritable equality (second job). In the second job we defined a Sort Comparator to get a descending order on float values. Secondary sort is a technique which can be used for sorting data on multiple field. It relies on using a Composite Key which will contain all the values we want to use for sorting. In this section we will read our “donations” Sequence File, and map each donation record to a (CompositeKey, DonationWritable) pair before shuffling and reducing. All classes used in this section can be viewed on GitHub in this package : https://github.com/nicomak/[…]/secondarysort. The MapReduce secondary sort job which is executed to get our query results is in the OrderByCompositeKey.java (view) file from the same package. Note : I implemented the compareTo() in this class, but it’s simply as default natural ordering, comparing all fields in ascending order. Our query wants to sort the “total” field in descending order, and for that we will create a specific Sort Comparator in the next paragraph. We then set this class as the Sort Comparator with job.setSortComparatorClass(FullKeyComparator.class). Mission accomplished ! Using a single reducer will now give us the fully sorted result. Implementing the Composite Key and Sort Comparator is enough to sort on multiple fields when using only one reducer. But if we used multiple reducers, what would happen ? The default partitioner, HashPartitioner, would use the CompositeKey object’s hashcode value to assign it to a reducer. This would “randomly” partition all keys whether we override the hashcode() method (doing it properly using hashes of all attributes) or not (using the default Object implementation which uses the address in memory). In the first output column, within a reducer, the data from a given state are sorted by city name and then descending total donation amount. But this sorting doesn’t mean anything because some data is missing. For example Reducer 0 has 2 sorted Los Angeles keys, but the Los Angeles entry from Reducer 1 should have been between both. We set this class as the job’s partitioner with job.setPartitionerClass(NaturalKeyPartitioner.class). The Group Comparator decides how values are grouped for each call to the reduce method. There are no keys with the same combination of (state,city,total). So with the first grouping, the reduce method is called once for each record. The second grouping is by “state,city”. The keys from B and C pairs have the same state and same city, so they are grouped together for a single reducer() call. The key which is passed to the function is the key of the first pair of the group, so it depends on the sorting. The third grouping only looks at “state” values. All keys from B,C,D have the same state, so they are grouped together for a single call to reducer(). Grouping can be useful in some cases. For example, if you can to print the sum of all total donations for a given city next to each donation output, you can use the second grouping from the example above. Doing that, you could sum all “total” fields in the reduce() function before writing out all values. For our query we only need to print out fields from each record, so grouping doesn’t matter. Calling the reduce() function 4, 3 or 2 times will still result in simply printing out the (id, state, city, total) fields for A,B,C and D records. For this job it did not have any influence on the performance. We can then use this comparator by calling job.setGroupingComparatorClass(NaturalKeyComparator.class). The following jobs were run on my mini cluster of 1 master and 4 slave nodes, with 2 GB of RAM each, allocating 1 GB containers for mappers and reducers. The input “donations” Sequence File that we created in part I was split into 4 HDFS blocks, so 4 mappers are running for this job. The job executed here is the one from my GitHub repository, in the OrderByCompositeKey.java class (view). Since only 1 reducer was use, there is only 1 output file. The file starts with state “AA”, which is not a USA state, but seems to regroup foreign cities. The file ends with “WY” (Wyoming) cities Wilson and Worland. Everything is sorted as requested in the query. This time we use 3 reducers by setting job.setNumReduceTasks(3) and we comment the job.setPartitionerClass(NaturalKeyPartitioner.class line to see what happens. By looking at the last 5 lines of each output, we can notice that all outputs have entries with the Wilson city. Two of the outputs have entries with Worland city. As explained earlier, the results in each output is correctly sorted with ascending state and city, and descending donation amount. But it’s impossible to view all sorted donations for a given state or city, since they are spread across multiple files. For this job we simply reposition the job.setPartitionerClass(NaturalKeyPartitioner.class) command to use our custom Partitioner, while keeping the 3 reducer tasks. Compared to the outputs of Job 2, we can see that only one reducer (r-00002) has the entries from “WY” state (Wyoming). So if you are only interested in donations coming from Wyoming, the results you are looking for is complete and correctly sorted in a single file. Other reducer outputs end with different states (“VI” and “WI”) because each state is exclusive to a reducer. This is because we told our NaturalKeyPartitioner to consider the “state” field as the decisive value for partitioning. Here is a table of comparison of the 3 jobs described in this section. The total time was taken from the Resource Manager UI. The other values were taken from the MR History Server UI. All metrics were averaged on 2 executions. We can observe a significant improvement of total execution time when using 3 reducers. Jobs 2 and 3 are faster than Job 1. In jobs 2 and 3 there are longer shuffling/merging times for each reducer but the actual reduce time in a lot shorter. In this part we learned how to use some tools to have more control on partitioning, sorting and grouping during the shuffle phase. Sort records with a same natural key on secondary keys – when using multiple reducers. Using multiple reducers can speed up the sorting process, but at the cost of having only partially sorted natural keys across reducers. Secondary Sort is a technique to control how* a reducer’s input pairs are passed to the reduce function. Based on this definition, using Secondary Sort we have total control on the data within a reducer, and that is why the outputs files were always internally sorted. Using Secondary Sort we have control on the data within a reducer, but we can’t control how sorted map outputs are distributed to reducers yet. We have defined a partitioner to make sure that the different reducers manage their own natural keys and maintain coherent ordering on secondary keys. But it didn’t solve the problem of having all natural keys sorted across all outputs. In the next post, we will learn how to do that with Total Order Sorting. The best blog. Ultimate . May god bless you. Thanks ! I’m glad you liked it. Amen. This is one of the best article that explains this complex concept. I appreciate your time and effort. By far the best explanation of this I’ve ever read. Thanks for your clear and thorough writing – it was very helpful for me.